My first hands on lesson from one of my eCourses on how to cook the nutrient dense way is to cook a soaked whole grain. The main recipe we were given was to cook brown rice, but since Rene is currently cutting out rice from his diet to test a food sensitivity, I decided to cook spelt instead. This is quite a simple recipe that just about anyone can do, but that didn’t prevent me from messing it up, or at least thinking I seriously messed up in the middle of preparing this dish! 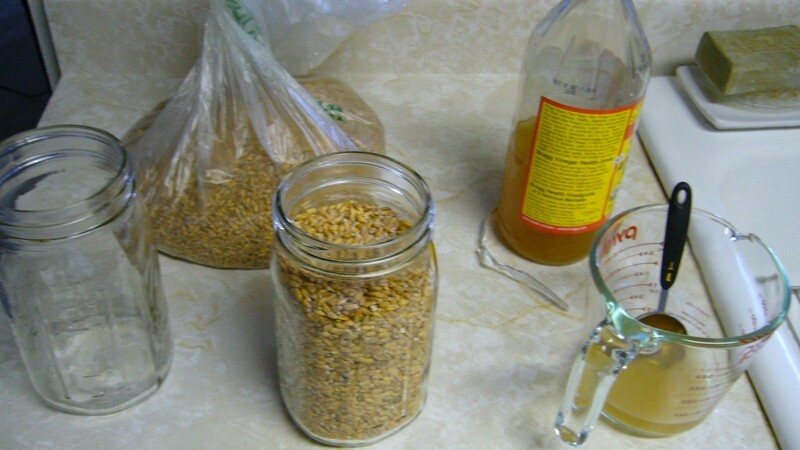 First, I gathered some spelt I had found at Whole Foods and measured out the raw apple cider vinegar. I pulled out a new stock pot that I had gotten for the eCourse. Ideally, this should not be stainless steel as recent research says that stainless steel will react to acidic foods, and I’d be soaking the grains in this pot with the raw apple cider vinegar. I wasn’t aware of this new information until weeks after I purchased my stock pot, which bummed me out a little. However, I decided that I’d make do with my new stock pot rather than stress over the fact that the acid and stainless steel might be reacting. This is what I have available now, and I’ll move towards ideal cookware in small steps. Next step was to combine the spelt, water and apple cider vinegar, and soak over night. 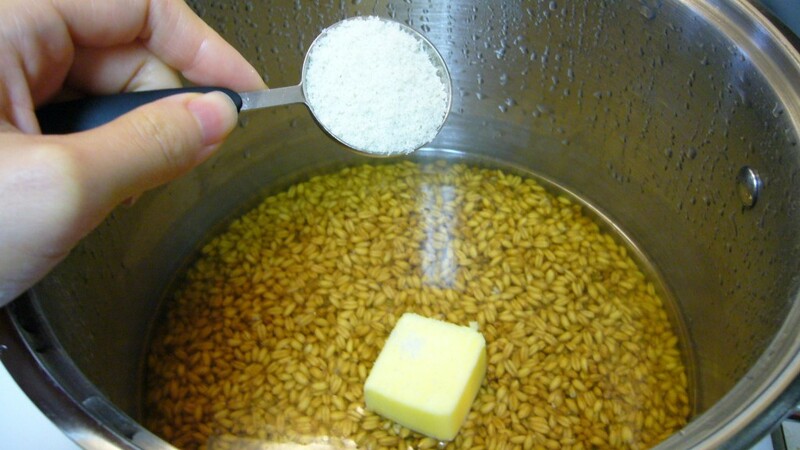 This step is to help neutralize the phytic acid found in the grain. Phytic acid is found in grains, nuts, and seeds (including soy) and prevents our bodies from absorbing all the nutrients we eat when it is eaten in large quantities or in a poor diet. To neutralize phytic acid, grains, nuts and seeds need to be soaked (sometimes in an acid) and/or sprouted. Soaking and sprouting are simply ways to recreate germination in the grain/nut/seed, a natural way for the grain/nut/seed to become more alive and nutrient dense for us. In the photo below, I’m adding raw apple cider vinegar as my acid to my spelt and water. So far, so good! 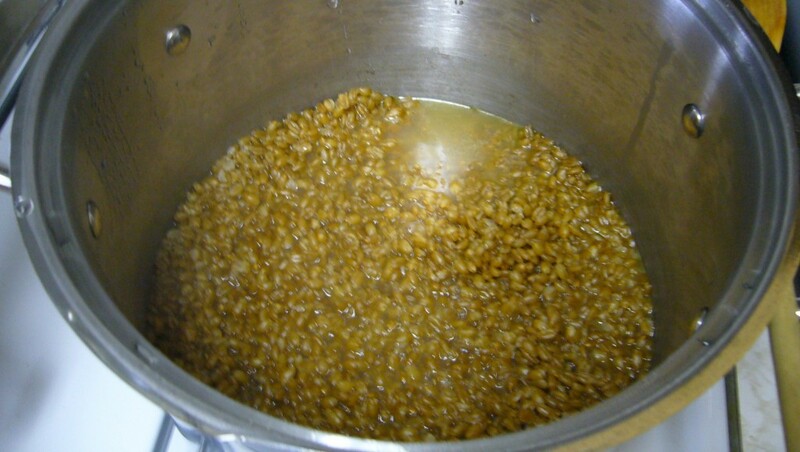 I left the spelt overnight to soak in the acid. The spelt didn’t look any different the next morning, but it did smell quite vinegar-y. Still looking good, yay! Then I added some fat (grass-fed butter) and celtic salt for seasoning. Can’t really mess this step up, I think. 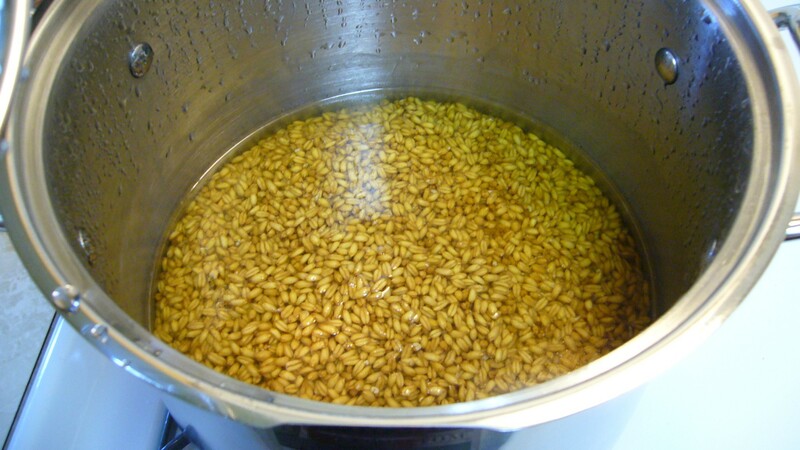 I proceeded to cook the spelt first to a hard boil, then slowly on medium-low heat. 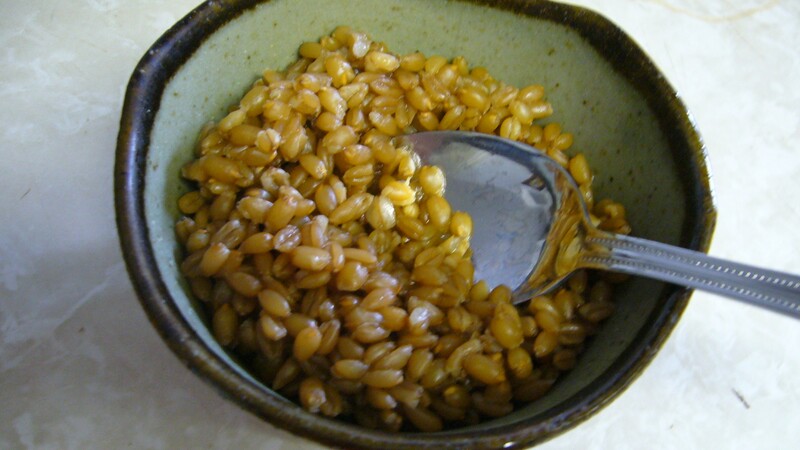 Supposedly, spelt should take about 25-30 minutes to cook after it has been soaked overnight with acid. 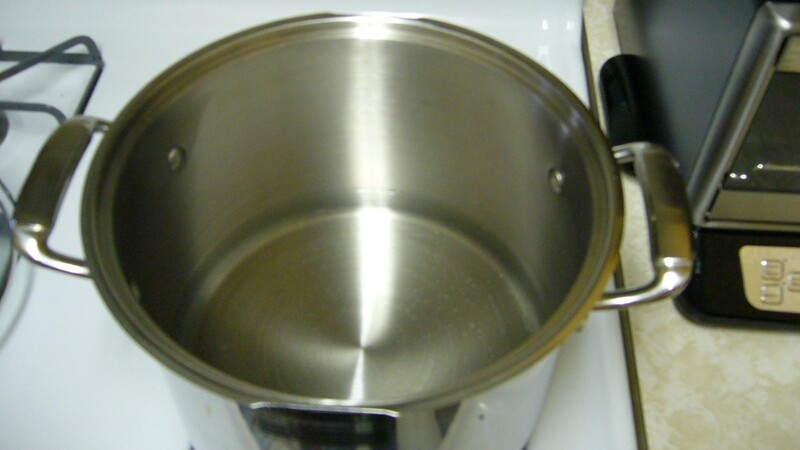 However, my pot of spelt took well over 2 hours to cook down the water, and I began to panic. For those two hours, my pot looked just like it does in the picture below and the spelt was very chewy and not fluffy like I expected it to be. I wondered as to what I had done wrong. Luckily, this is the very reason why I’m taking an eCourse to learn this stuff, rather than attempting this all on my own, so I contacted my instructor and she informed me that spelt is notorious for being chewy and that I should give it another half hour or so of cooking. So I followed her instructions and let it cook down just a bit more before I gave it the ultimate test: giving some to Rene to see if he liked it or not. Here’s the finished spelt I gave to Rene. I prefaced that it had been soaking in an acidic vinegar overnight so it would have a slight vinegar-y flavor, and that spelt is generally chewy. But it seemed that I didn’t need to tell him this after all because he loved it. I tried some, too, and after getting over my anxiety about the fact that I thought I almost screwed up this recipe, I thought it was quite delicious! The chewiness was a nice departure from other grains I’ve had before, and the vinegar flavor reminded me of sushi rice, which I love! 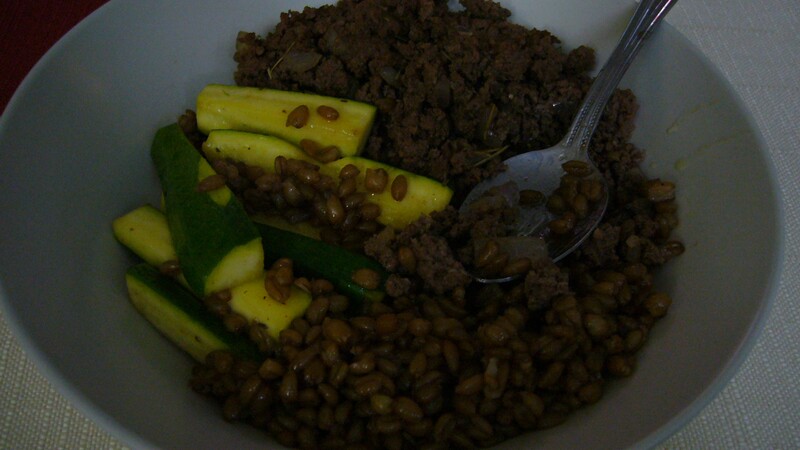 Later that night, I decided to celebrate my first successful recipe by making up a meal that features the cooked spelt. 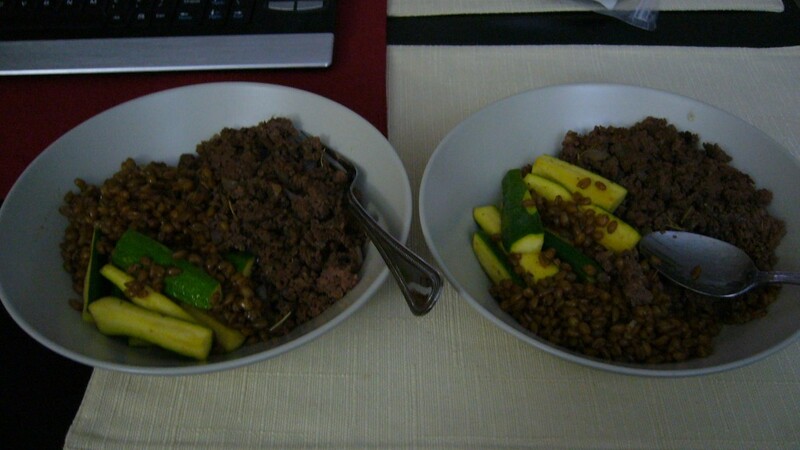 I cooked up ground up buffalo meat in lots of animal fat and spices, some zucchini and reheated the spelt in all the yummy fat drippings from the buffalo dish. 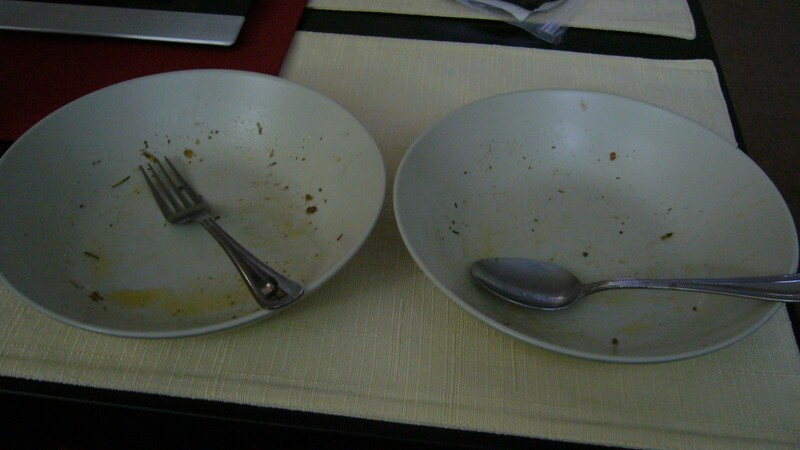 It was so delicious, Rene and I gobbled up our meals super quickly! This is definitely a meal I’ll be preparing again! 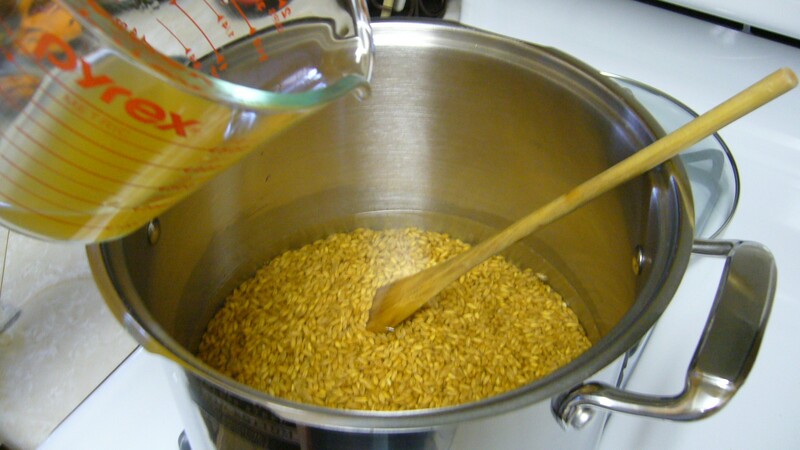 Do you have a great recipe for cooked whole grains? I’m such a noob to cooking and I’d love to get my hands on new recipes now that I’ve proven to myself I can at least cook one dish properly. Please share your awesome recipes! Hi, Jocelyn! Just found your blog today, and it is lovely! I use the Hybrid theme framework, too, for all my websites. Your spelt looks wonderful – I think it is funny that you had those disclaimers ready, but Rene had no need for them and loved it! Thanks Wardeh! I actually really liked your website design, looked up Hybrid and found it to be really awesome! In the past I’ve made things that were not so yummy for Rene, so I’ve been very careful about giving disclaimers for my cooking. But with your course, I don’t have this problem anymore, everything comes out delicious! Thanks! !